Friday we got a look at Blake McFarland. He's unusual in that he's an athlete and an artist. (Shoutout to Fowl for pointing me in his direction!) There's places that talk about him as a pitcher. There's a piece by Jeff Passan that talks about his intersection of baseball and art. Keegan Matheson at Jays Journal wrote a profile on him as more than a player right after the Passan piece. Cathal Kelly wrote a non-garbage clown piece for a change, profiling him at the beginning of camp. So what more is there to talk about? How about the art itself? The clip from his Gallery 85 bio (unfortunately closed) outlines his journey as an artist. 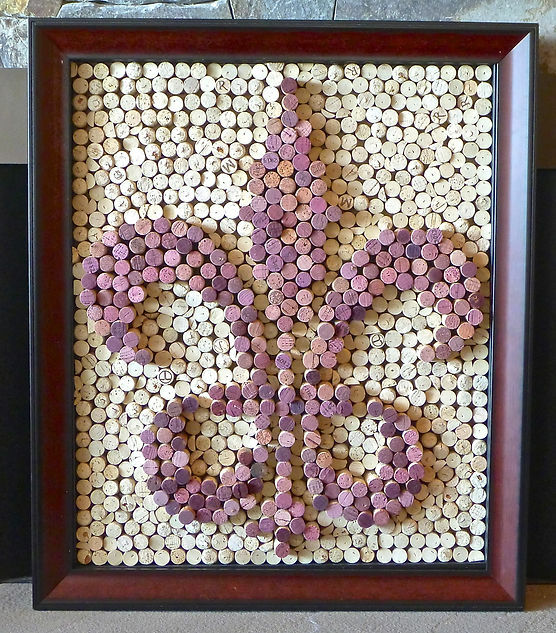 Blake uses 100% recycled natural wine corks to create mural pictures of amazingly detailed pictures or words. Blake uses between 200 to 4,000 wine corks in each picture...Blake began his art career painting ocean scenery with acrylics. (He then) combined one of his passions, surfing, with art by painting local Bay Area scenes on surfboards.To expand his artistic resume he also crafted aged wine barrels into wine and glass racks. Inspired by the current “green movement,” it was not until 2013 he finally found his calling in tire sculptures. These tire sculptures are by far the most detail-oriented and finest art pieces he has ever created. It takes over a month to create one sculpture due to the amount of detail put into each piece. Blake loves the fact that tire sculpture is not only visually appealing, but also eco-friendly. Each tire is 100% recycled... Blake portrays the animals’ muscle structure and fur using tires with different treads and widths. You can see one of those animals in the photo above. There's more at his official website. What I love about his pieces are the detail and the sense of movement. The use of glass for the eyes makes them piercing and lifelike. He does a very good job of using the different types of treads to create texture. It creates a desire to reach out and touch. The choice of tire as the primary material is unusual but payoffs in a big way. It makes his work distinctive, always a good thing for an artist. The thing I love most is the motion. He has them all in active poses (yes, even the shark and panda are in active mode), which are more challenging to craft but gives them animation you just can't achieve in still life. As a viewer, it makes the work just so much more compelling. I feel like I could look at these pieces every day and still find some cool detail to them. A bonus when you're trying to sell. As for the cork work, it's not nearly as compelling. That's not to say that the work is not impressive or bad art. He bills them as "naturally stained", which I take to mean from the wine themselves. Because each cork has a slightly different stain, it creates a natural texture for the images. This one above he completed after he was added to the 40-man, presumably as a thank you to the club. I just can't get excited about the subject matter. Yes, flags are cool but not original. The pieces are obviously aimed to be hung as conversation pieces. You can order custom plates, which indicates that this is the area he feel he can confidently sell. However, I do love one, the Fleur-de-Lis, as it is not flat but three dimensional. It pops in a way the others don't. Overall, I'm more interested in seeing where he goes as an artist than a pitcher. Not that I'd be unhappy to watch him pitch for us, mind you.